Rock Hydra comes into play with X +1/+1 counters on it. 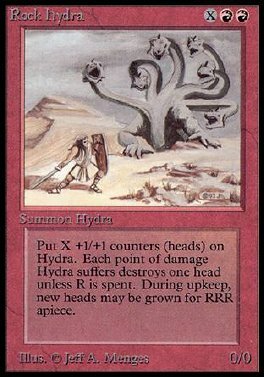 For each 1 damage that would be dealt to Rock Hydra, if it has a +1/+1 counter on it, remove a +1/+1 counter from it and prevent that 1 damage. R: Prevent the next 1 damage that would be dealt to Rock Hydra this turn. RRR: Put a +1/+1 counter on Rock Hydra. Play this ability only during your upkeep.